Is the pressure too much for Messi & Argentina? How did you rate Modric & Messi? His curled shot from range drifted beautifully beyond Caballero’s dive to put his side two ahead, before Rakitic’s injury-time tap-in sealed a victory that moves the Europeans through to the knockout stage and also leaves them in a strong position to win the group. 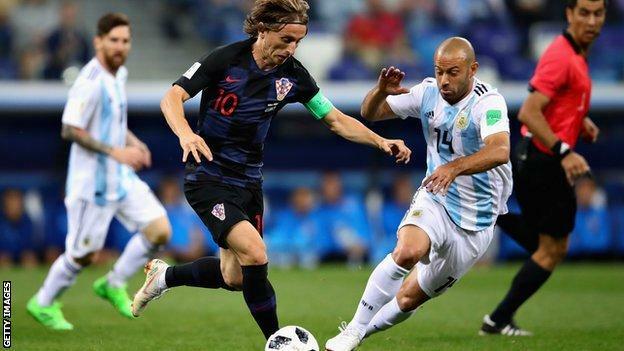 Match ends, Argentina 0, Croatia 3. Second Half ends, Argentina 0, Croatia 3. Foul by Nicolás Tagliafico (Argentina). Danijel Subasic (Croatia) wins a free kick in the defensive half. Vedran Corluka (Croatia) is shown the yellow card for a bad foul. Substitution, Croatia. Vedran Corluka replaces Mario Mandzukic. Goal! Argentina 0, Croatia 3. Ivan Rakitic (Croatia) right footed shot from the centre of the box to the bottom left corner. Assisted by Mateo Kovacic following a fast break. Attempt saved. Ivan Rakitic (Croatia) right footed shot from outside the box is saved in the bottom left corner. Assisted by Andrej Kramaric. Corner, Argentina. Conceded by Domagoj Vida. Attempt blocked. Maximiliano Meza (Argentina) left footed shot from the centre of the box is blocked. Assisted by Lionel Messi. Attempt missed. Luka Modric (Croatia) right footed shot from outside the box misses to the left. Attempt blocked. Mario Mandzukic (Croatia) left footed shot from outside the box is blocked. Assisted by Mateo Kovacic. Mario Mandzukic (Croatia) wins a free kick on the right wing. Marcos Acuña (Argentina) is shown the yellow card for a bad foul. Attempt missed. Mateo Kovacic (Croatia) header from the centre of the box is high and wide to the left following a set piece situation. Ivan Rakitic (Croatia) hits the bar with a right footed shot from outside the box from a direct free kick. Nicolás Otamendi (Argentina) is shown the yellow card. Foul by Javier Mascherano (Argentina). Foul by Gabriel Mercado (Argentina). Mateo Kovacic (Croatia) wins a free kick on the left wing. Attempt saved. Gonzalo Higuaín (Argentina) right footed shot from outside the box is saved in the centre of the goal. Maximiliano Meza (Argentina) wins a free kick on the right wing. Substitution, Croatia. Mateo Kovacic replaces Ivan Perisic. Goal! Argentina 0, Croatia 2. Luka Modric (Croatia) right footed shot from outside the box to the bottom right corner. Assisted by Marcelo Brozovic. Attempt blocked. Ivan Rakitic (Croatia) right footed shot from the left side of the box is blocked. Assisted by Andrej Kramaric. Corner, Argentina. Conceded by Dejan Lovren. Delay in match Ivan Rakitic (Croatia) because of an injury. Lionel Messi (Argentina) wins a free kick in the defensive half. Foul by Maximiliano Meza (Argentina).